Achieving the Dream, Inc. is a national nonprofit that is dedicated to helping more community college students, particularly low-income students and students of color, stay in school and earn a college certificate or degree. Evidence-based, student-centered, and built on the values of equity and excellence, Achieving the Dream is closing achievement gaps and accelerating student success nationwide by: 1) guiding evidence-based institutional improvement, 2) leading policy change, 3) generating knowledge, and 4) engaging the public. Conceived as an initiative in 2004 by Lumina Foundation and seven founding partner organizations, today, Achieving the Dream is leading the most comprehensive non-governmental reform network for student success in higher education history. With over 200 institutions, more than 100 coaches and advisors, and 15 state policy teams - working throughout 35 states and the District of Columbia – the Achieving the Dream National Reform Network helps more than 4 million community college students have a better chance of realizing greater economic opportunity and achieving their dreams. The Middle-Skill STEM Pathways Initiative increases the number of underrepresented college students who succeed in STEM education that leads to well-paying middle-skill jobs. 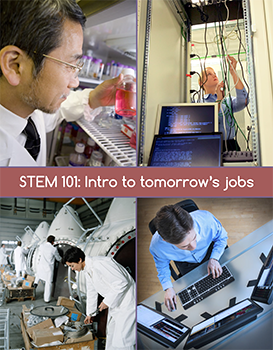 Jobs for the Future helps states and community colleges collaborate with local employers, public schools, and other community partners to align policies and practices to develop highly structured academic pathways, with comprehensive student supports, into STEM careers that require less than a four-year degree.